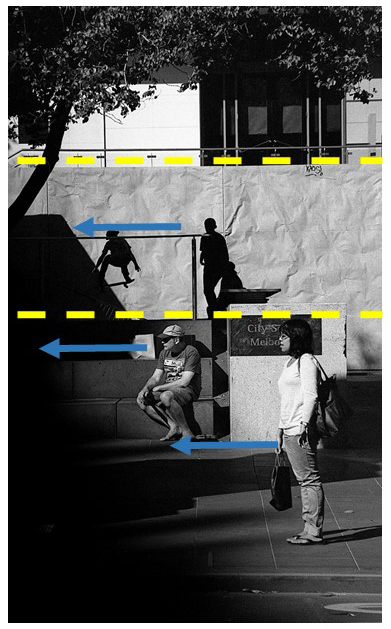 Why does street photography matter? “One way of looking at it maybe, like other art forms it does not matter at first. I mean, there was always sound but someone decided to make music. Likewise, maybe, it did not matter at first, then somebody shoots an amazing image at a very random location, time etc. then it became an art form. Although none of the variables is under control, it may still be possible to find something surprising, touching. I refrain from saying “beautiful”, since the intention in street photography is more towards finding something real and raw, rather than a refined, composed studio shot. 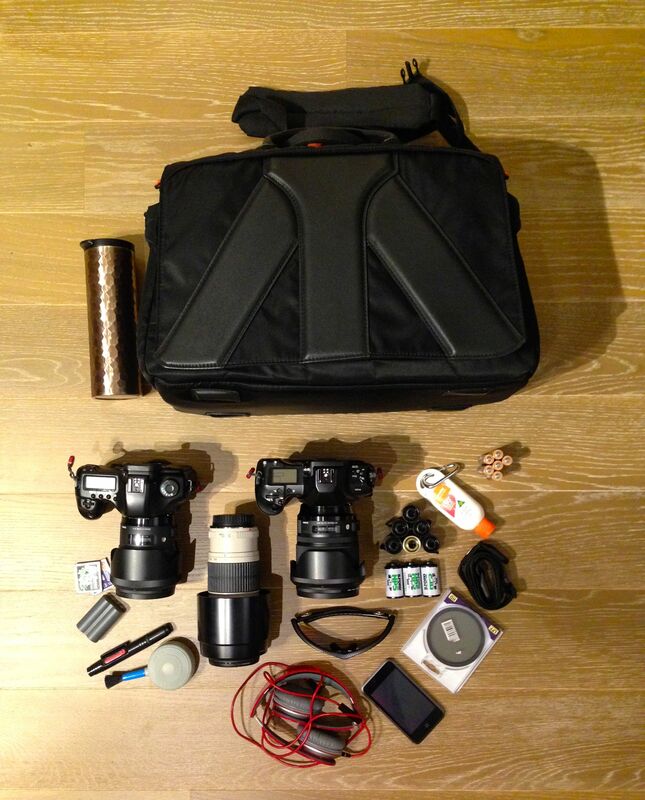 “I have two sets of gear actually. I sometimes take it easy and just take my medium format camera. I have only one lens on it so not much to worry about. Mamiya 645AFD with a film back. I usually go digital when I finish my film or when colour is crucial. Otherwise, I am all for analog these days. Therefore, the thrill is prolonged. I remain excited about a photo during all the timeit takes for me to develop the film and then take it into the darkroom to print it. 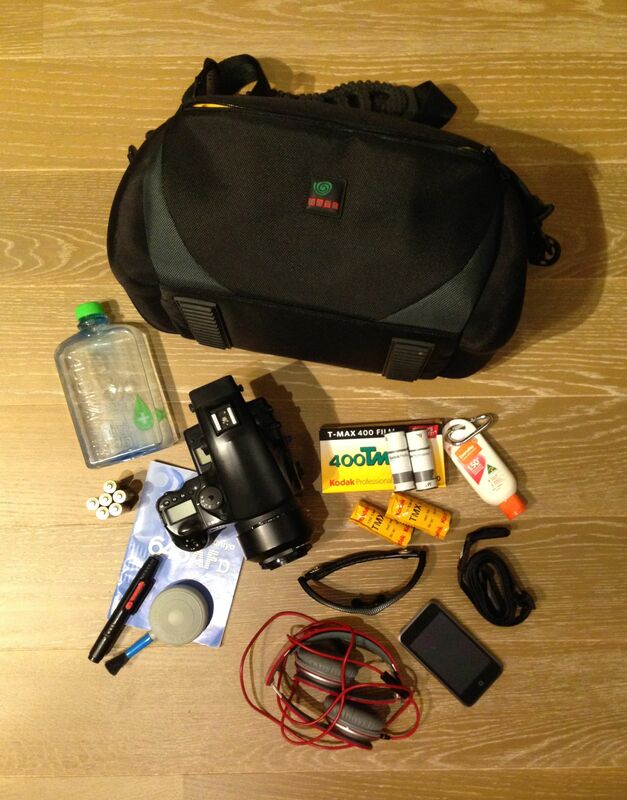 MSP : I love a good film kit! What is your favourite “go to” location in Melbourne? What got you interested in street photography? Muzaffer’s image is another ripper from SITHOM. Firstly, the image has three clear planes of texture / contrast which are not evenly divided, but help break up the image. All the subjects in the image are directing their focus to the left of frame, which gives a certain suggested uniformity, or pattern to the image. It reverses the viewers natural entry point on the left and encourages starting at the right of frame, and moving across to left. Very unusual, and works effectively in creating interest in the image. It is almost like swimming against the current, but in such a graceful way that nobody notices how hard you are paddling. The contrast between the light and dark parts of the image are divided by a subtle diagonal line, which adds to the already dynamic feel of the image. Diagonal lines are fantastic tool to pull out when you are having a “meh” kind of day out shooting. 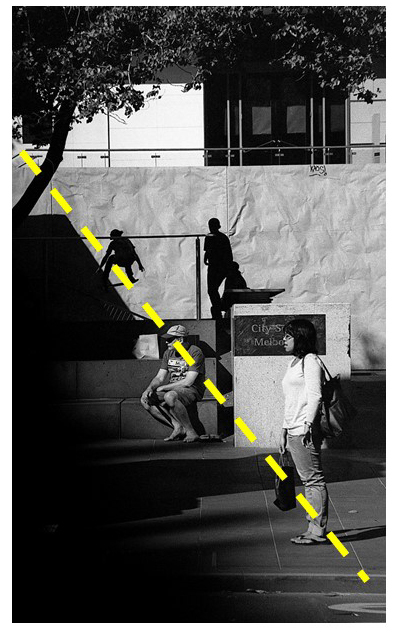 Not only are the light and dark parts of the image divided by this line, but three of the subjects have been placed along it to increase it’s prominence without being overt. The subjects, along with the natural line of the wall form a triangular shape, again adding to a dynamic feel. The subejcts are also on clearly different planes with the three dimensions of the image, which gives a feeling of depth. Looking even more closely at the image and spending some time with it, a gestalt triangle appeared, overtaking the more obvious one in the previous image. 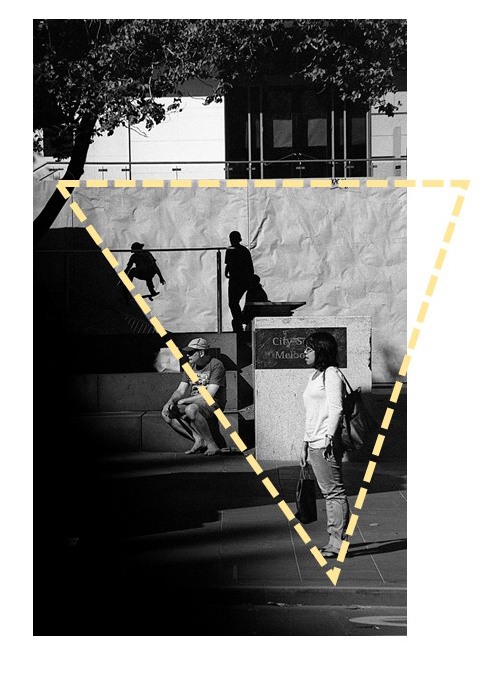 A gestalt shape is an image where the brain is left to complete the image using imagination… Now, all I see is the gestalt triangle, running outside of the frame. Having to complete the final corner of the triangle using only my imagination creates for a very engaging experience as the viewer. Thanks for taking the time to talk today, Muzaffer! Muzaffer’s SITHOM page is here. I love the little bottle of sunscreen!